Elemis Nourishing Omega Rich Cleansing Oil 195ml. Condition is used. I used it twice and it just wasn’t for me. elemis pro collagen marine cream. 30ml. Condition is New. Dispatched with Royal Mail 1st Class. This is a great way to try this legendary cream before buying the full size, which on the Elemis website is £85 for 50ml making this tube worth £25. Elemis Pro-Collagen Marine Cream 30ml. Condition is New. Dispatched with Royal Mail 1st Class. Elemis Pro Collagen Marine Cream 30ml. Condition is New. Dispatched with Royal Mail 1st Class. Elemis Pro-collagen Oxygenating night cream. 15ml size. Condition is New. Dispatched with Royal Mail 1st Class. Elemis Soothing Apricot Toner 200ml. This refreshing, gentle Elemis Soothing Apricot Toner will calm your skin and reduce irritation, giving rise to a fresh sensation and radiant appearance. This toner is ideal for extra sensitive skin to balance and soothe. 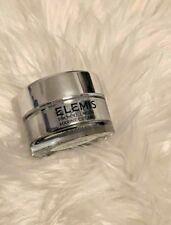 elemis pro collagen marine cream & Balm 15ml Brand New. Condition is New. Dispatched with Royal Mail 2nd Class. Elemis Smooth Solutions’s Gift Set. Contains Dynamic Resurfacing Face wash 200ml full size. Unopened Elemis Pro Collagen Marine Day Cream 30ml. Condition is New. Dispatched with Royal Mail 2nd Class. NEW Elemis Men Deep Cleanse Facial Wash 150ml / 5.0 fl.oz. Suitable for all skin types. To use: Apply a small amount to the palm of hand, mix with warm water to lather, cleanse the face and rinse with warm water. Skin is intensely cleansed, nourished and renewed for a glowing complexion. Luxury cleansing cloth included.For all skin types. Pro-Collagen Cleansing Balm. Ingredients of Pro-Collagen Cleansing Balm. These potent facial oil formulations act to de-stress the skin, helping to break down the accumulation of harmful toxins that clog up the skin. The aromatic essential oils provide a beautiful therapeutic effect to enhance feelings of well-being and relaxation. Restoring Night Cream-Oil. Skin follows natural circadian rhythms which boost repair and renewal at night. Brand new Elemis pro definition eye and lip contour cream 5ml Plus: Day cream 15ml Anti ageing range. Check out my other items for sale! Product is not sold with a box. ELEMIS Superfood. New & Sealed. Skin follows natural circadian rhythms which boost repair and renewal at night. Peptide⁴ Night Recovery Cream-Oil. Restoring Night Cream-Oil. ELEMIS Dynamic Resurfacing Bundle. Condition is Used. Dispatched with Royal Mail 2nd Class. Included is the Dynamic Resurfacing Day & Night cream, and face wash - as well as a tester of the superfoods oil. All have been used to some extent. The day cream only has a minimal amount left where as the night cream still has quite alot left and the face wash is 3/4 full. Unfortunately my skin suddenly decided it doesn't like these products and it seems a shame to throw them away. So if you are wanting to try this product before buying a new tub, here's the perfect opportunity to grab a bargain and try it before you make the plunge! Day cream retails at £85 Night cream at £60 Face wash at £20 So grab a bargain! I HAVE HERE A BRAND NEW LIMITED EDITION ELEMIS PRO-COLLAGEN ANTI-AGEING EYE DUO. SEE THE DIFFERENCE BOXED SET. IT CONSISTS OF:15 ML PRO-COLLAGEN ADVANCED EYE TREATMENT ANTI WRINKLE EYE SERUM COST £4515 ML PRO-COLLAGEN EYE RENEWAL ANTI WRINKLE EYE CREAM COST £67.50 = £112.50!GENUINE REASON FOR SELLING....I WAS GIVEN THIS AS A VERY GENEROUS GIFT BUT UNFORTUNATELY I ONLY USE CLARINS. Pro-Collagen Super Serum Elixir. Clinically proven, this concentrated anti-ageing super serum elixir significantly reduces the appearance of fine lines and wrinkles . Ingredients of Pro-Collagen Super Serum Elixir. **Brand new unopened sealed *** Elemis bag and exotic blooms shower nectar, 3 x Exotic blooms hand nail , 2x frangipane buddy oil, frangipane body cream 100 mils. From no smoking home, posted by hermes . Elemis Peptide4 Thousand Flower Mask 15ml. Elemis Pro-Collagen Oxygenating Night Cream 15ml. Elemis White Flower Eye and Lip Make-Up Remover 28ml. 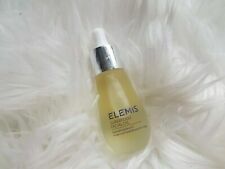 Elemis Soothing Apricot Toner 50ml. Elemis Pro-Radiance Cream Cleanser 30ml. Pro-Definition Facial Oil 15ml. Facial oil for mature skin. Fine lines appear reduced and skin appears toned. For a luminous lift. NEW Elemis Anti-Ageing Dynamic Resurfacing Facial Wash 200ml / 6.7 fl.oz. Elemis Bundle Contains 5 Items plus Free gift of an Elemis Lip Revive. Consists of Elemis bottle spa home skin nourishing shower cream (body soothing) 300ml Elemis skin nourishing shower cream (body soothing) 200ml Elemis skin nourishing hand and nail lotion (body soothing) 100ml Elemis spa home skin nourishing body cream (body soothing) 50ml Elemis spa home skin nourishing body scrub (body soothing) 50ml And FREE elemis lip revive 5ml Comes in new blue Elemis Toiletry bag Condition is New. Dispatched with Royal Mail 1st Class. SUPERFOOD FACIAL OIL - 15ML. RRP £45.00. 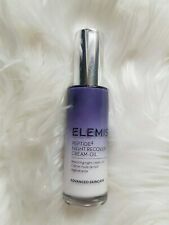 Elemis pro collagen overnight matrix 30ml. Condition is New. Dispatched with Royal Mail 1st Class. This is brand new sealed and 100ml. It is new fresh stock and authentic. Pro-Collagen Neck & Décolleté Balm Anti-wrinkle neck balm Firm and smooth the delicate skin of the neck and décolleté with this powerful balm. In just 28 days this area appears smoother, softer and more youthful*. PRODUCT DETAIL Firm and smooth the delicate skin of the neck and décolleté with this powerful balm. Sea Buckthorn oil, one of the richest known plant-sources of Fatty Acid Omega-7, is expertly blended with the unique Mediterranean algae Padina Pavonica to help hydrate, nourish and reduce the appearance of wrinkles and fine lines.